MSF announced the opening of a new emergency surgical center in the Tabarre neighborhood of Port-au-Prince that will provide trauma, orthopedic, and visceral surgical services. The entrance to MSF's new surgical center in Tabarre. Port-au-Prince, April 11, 2012—The international medical humanitarian organization Doctors Without Borders/Médecins Sans Frontières (MSF) today announced the opening of a new emergency surgical center in the Haitian capital, Port-au-Prince. The center, located in the Tabarre neighbourhood, in the east of the capital, will provide trauma, orthopedic, and visceral surgical services. 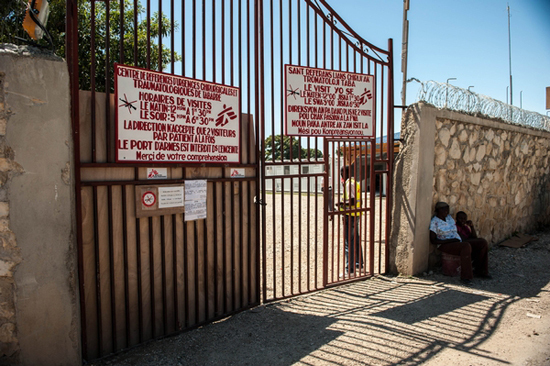 Named ‘Nap Kenbe’—Creole for “staying well”—the surgical referral center is the third facility providing emergency treatment to be opened by MSF in Port-au-Prince since the January 12, 2010 earthquake, and its fourth in the Ouest department. Work on the 107-bed center began in 2011 and was completed in February, 2012. The center treats victims of accidental trauma, such as falls and road accidents, and victims of violence who have suffered beatings, assaults, and gunshot wounds. In a country where 75 percent of the population lives below the poverty line, and where referral facilities are vastly inadequate, MSF’s new center will improve access to surgical care for the population of Port-au-Prince’s metropolitan area. MSF has been working in Haiti since 1991, responding to crises and natural disasters. After the earthquake of 2010, MSF launched the largest emergency operation in its history. Today, MSF delivers emergency care in Port-au-Prince and Léogâne. In Port-au-Prince, MSF runs emergency trauma centers in the poor neighbourhood of Martissant and in Drouillard hospital near the Cité Soleil slum, assisting people injured by violence and road accidents. MSF also runs a referral center for obstetric emergencies in Delmas, to help combat high rates of maternal mortality. In Léogâne, MSF runs a hospital providing emergency surgical care, obstetrics, gynecology, and pediatrics. During the cholera epidemic of 2010-11, MSF treated more than 30 percent of the country’s cholera patients. As the rainy season approaches, MSF remains ready to respond to any recurrence of the epidemic.